Last month we held our third annual Chef of the Year 2019 Competition and I have to say it was the closest and hardest fought one yet. The competition came about from a conversation between our chef consultant Adam Byatt and me after one of our monthly masterclasses at his Michelin starred restaurant Trinity in Clapham Common. We wanted to give the chefs in bartlett mitchell a platform to show what they are made of and a chance to show the whole company the skills they have when it comes to producing top level food under great pressure. Every year it steps up a gear and as we grow as a business. The calibre of the chefs we have, increases along with it. This year we had over 25 entries at the first stage, which is a written menu for a four course menu for 30 diners held in January. You can tell a lot about a chef from the style of menu they write. From this Adam and I cut the chefs down to 14 who would take part in the semi-final. 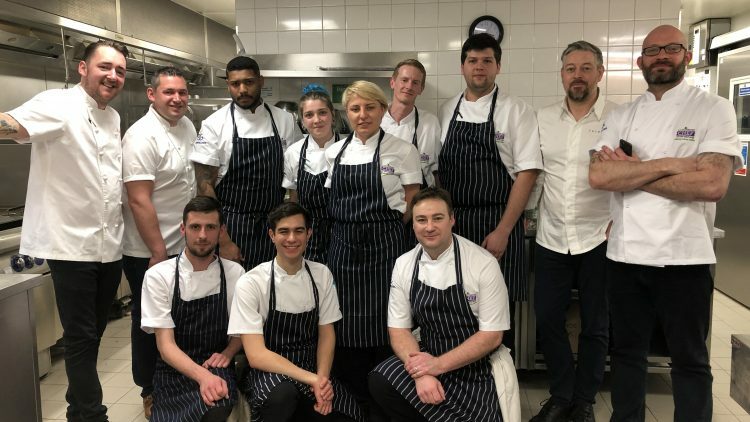 Due to the large number we split the semi-final over two of our central London sites, our other chef director David Steel, Adam Byatt and last year’s winner Will Rose took half the group to Canary Wharf. Company development chef Daryll Young and Trinity sous chef Harry Kirkpatrick and I took the other group to another location in the city. The chefs had to complete a task which included using a combination of good classic skills along with an off the wall mystery table of waste products, given to us by our amazing suppliers, that included nearly rotten fruit and veg, a selection of meat trim and off cuts, tuna bones, hake heads and some offal. The chefs all did amazingly well but we had to make the cuts, so after some hard judging we chose our final 8 chefs. In the run up to the final we had a few chef trips to help inspire the chefs for their final task. These included: a visit to Goodfellows who very kindly sponsored the provision of the plates and service equipment, an early morning visit to a vegetable market with Richard Harris and Adam, so the chefs could see exactly what seasonal produce would be available the following week, and a masterclass at Trinity around inspiration and modern interpretations of classic dishes. For the final the chefs had to produce four portions of a starter using red mullet and a mystery basket, their own interpretation of a coq au vin and a pear and almond tart, all in three hours! I was joined for the final judging by three chefs who all hold a Michelin star! They were: Adam Byatt from Trinity, Mark Kempson from Kitchen W8 and Matt Worswick from the Latymer at Pennyhill Park. It’s an amazing, but extremely nerve racking experience for the bartlett mitchell chefs to cook for chefs of this calibre and we even had a live feed of the action in the kitchen displayed on the large screens in the restaurant so colleagues, clients and directors could watch all the action first hand. After a hard fought three hours we could only have one winner and this year the title was taken by Vincent Smith who is a hospitality Head Chef of a top London law firm. The judges were so impressed with the chefs who took part, they have been invited to complete a week long work placement at their restaurants! This will only add to the amazing learning process they have experienced so far. Vincent will also be taken away to an international culinary city for a few days with Adam and myself to eat at some of the world’s best restaurants and other culinary hot spots. This competition is really the highlight of the culinary year at bartlett mitchell and showcases the outstanding level of talent we have in the business. Win or lose I know all the chefs have been on an amazing journey that will stay with them for the rest of their lives and I honestly can’t wait to see what the next year will bring for these talented chefs.